It's hard to imagine now, but the majestic stone cellar of Flora Springs was once an abandoned "ghost" winery. It was Flora who saw the magic hidden behind decades of neglect, over-grown ivy, and shifting rock walls. The property's winemaking roots date back to the 19th century, but it's been the work of Jerry and Flora's children, John Komes and his wife Carrie, and Julie Garvey and her husband Pat Garvey, that has written the history. Located at the base of the Mayacamas Mountains in the far Northwest corner of the Rutherford appellation, the Flora Springs estate is in the heart of the Napa Valley. Founded in 1978, Flora Springs has been a family affair for over three decades. As both artisan winemakers and growers, the family is committed to the traditions of fine winemaking and responsible stewardship of its 650 acres of vineyard land for future generations to savor and uphold. Today, ninety percent of Flora Springs' red wines are sourced from its organically-farmed estate vineyards, and all of these wines are crafted in our solar-powered 19th-century stone winery and caves. 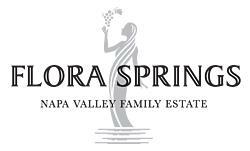 Named after our mother and grandmother, Flora, and for the natural springs on the winery property that have flowed uninterrupted even through periods of drought, Flora Springs is both our life's work and our home. Third-generation vintners Nat Komes and Sean Garvey, both of whom grew up at the winery, are now poised to take the helm guiding the winery into a new era of artisanal winemaking in the spirit of tradition, innovation, and community values epitomized by their grandparents, Flora and Jerry. Wine Enthusiast 90Fleshy, full-bodied and floral, this wine is generously proportioned in stone fruit and Meyer lemon tones. These tones complement the palate well, giving a sense of substance and style. Wine Enthusiast 92"A lovely wine, soft and charming, but far from simple. Although it has complex layers of cherries, blackberries, cassis and cedar, it also shows a fine structure of ripe, smooth tannins and supporting acidity. Drink now–2015 while it’s fresh and forward. "- S.H. Wine Spectator 92Smart Buy"Elegant, even delicate, showing rich, subtle fig, nectarine and tangerine flavors wrapped in light toasty oak, with a gentle finish that caresses the palate. Drink now through 2009. 4,577 cases made. –JL"